Sukkot is known in Jewish literature as heChag – the Festival, although it is only one of the three pilgrimage festivals of the year. The others, Pesach and Shavuot, share with this seven day celebration both literal agricultural meanings and metaphorical religious meanings as part of the annual cycle that traces Jewish peoplehood from physical liberation through Divine revelation to Sacred Communion with God.The Sacred Communion is the special identity of Sukkot, for if Pesach recalls the Exodus from Egypt and its slavery, and Shavuot records ma’amad Har Sinai – standing at Mount Sinai – it is at Sukkot that the Ohel Mo’ed – the Tent of Meeting – is dedicated and put into use.That act of dedication of a tabernacle in which the Ark of the Covenant stood, and where Moses entered regularly through the 40 wilderness years, was the place where God and people would meet. In a continuation of that glorious tradition, King Solomon rehearsed the events of that dedication. It is relatively easy to review these texts as weekly Torah Portions Vayakhel and Pekudei (Exodus 22:1-40:35), and their respective traditional Haftarot (I Kings, chapter 7 & 8). Much later in Jewish history – 165 BCE – the re-dedication at the Feast of Lights – Hanukkah – also found this celebration so compelling that it became the model for that much younger semi-holiday. For Progressive Judaism, which follows the Israeli calendar around the world, there are two Festival days separated by the intermediate days of the festival – chol haMo’ed. 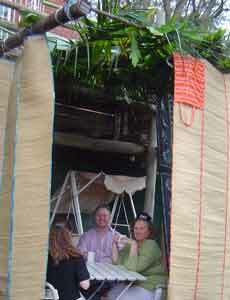 The rules of the Festival days, which by tradition are two distinct holidays – Sukkot and Sh’mini Atzeret-Simchat Torah (see below) – are less rigorous than those for Sabbaths, including both Yom Kippur – whatever day of the week it might fall on – and the Intermediate Sabbath of the Festival during either Sukkot or Pesach. In the citation above, the sacred occasion observed on the festival limits working at one’s occupation. On Sabbath, that limitation is expanded to “no manner of servile work”. The Sabbath restrictions are known as 39 melachot – the kinds of labour used in building the Ohel Mo’ed and its trappings, often expanded into related actions and activities, as well as the making of any fire. On Festivals and Rosh Hashanah, the tradition offers eruv tavshilin, a virtual start to preparation of food which allows cooking to take place and transfer of fire from an existing flame. They are bundled together, and in Midrash, viewed as representing the body and soul of each person: spine (lulav), eyes (shape of the myrtle leaves), lips (shape of willow leaves) and heart (shape of the etrog). Together, they symbolise the complete connection between Jew and God, between human and nature. Blessed is the Eternal our God, Ruler of the World, who makes us holy by commandments and commands us to dwell in booths. Blessed is the Eternal our God, Ruler of the World, who makes us holy by commandments and commands us to take up the lulav. Blessed is the Eternal our God, Ruler of the World, who brings forth bread from the earth. Blessed is the Eternal our God, Ruler of the World, who has kept us in life, sustained us and brought us to this joyous time. 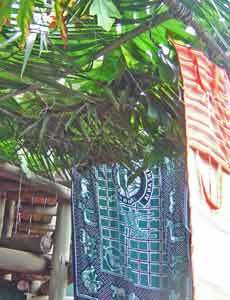 For those blessed with the luxury of outdoor space, a sukkah can be constructed at home. The booth is a temporary structure with a minimum of three “walls” which can be no less than three handbreadths wide. The booth may be free-standing or use existing walls. Critical is that the stars are visible through the grass-covered roof. The rugged will camp out in this open space; others might use it only at meal times. In any case, the experience of a meal in the sukkah with blessing, songs and good company is a unique experience of public proclamation of Jewish identity and pride. The days of dwelling in the sukkah end at Hoshanna Rabbah when the four species are carried for the final time. Although the sukkah is left standing, on the separate Shemini Atzeret-Simchat Torah Festival, life returns indoors to home or synagogue sanctuary. The emphasis shifts then to the cycle of Torah reading, which apparently was fixed through the Italian tradition about a thousand years ago. On one evening, the last words of Deuteronomy are read by a Chatan Torah – Bride/Bridegroom of the Torah followed immediately by the reading of the opening words from Genesis read by a Chatan B’reishit – Bride/Bridegroom of Genesis. Whether these two chatanim are male or female, it is a high honour to represent the community in its quest to proclaim aloud the centrality of Torah and its covenant. Simchat Torah is especially to be marked by the physical act of following the Torah scroll as the hakafot-circlings with the Torah-are accomplished. Dancing, singing and rejoicing are all the order of the day, inside and outside the sanctuary, and in many communities even into the courtyards and streets of the town. 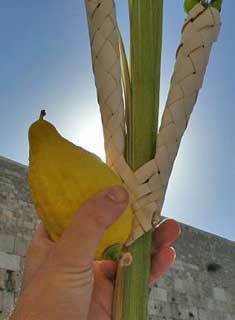 The lulav and etrog consist of palm, willow and myrtle branch, and a citron. The succah is walled on three sides and has branches across the top. The sky should be visible through the foliage of the roof.